Humorous moment during Euro 2020 qualifier. 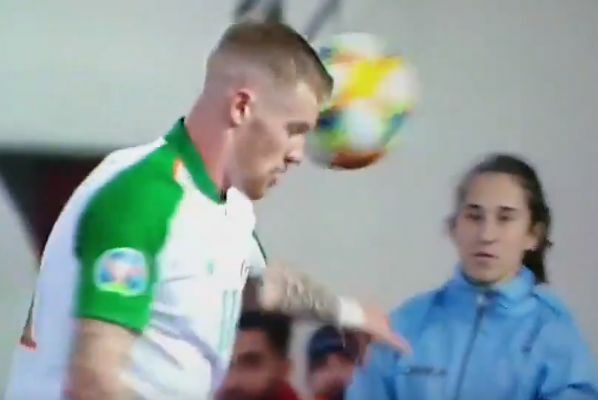 A ball girl threw the ball at James McClean after he’d turned away during Republic of Ireland’s 1-0 win in Gibraltar on Saturday. Stoke City winger McClean went over to the side of the pitch to grab a ball for a throw-in and the girl, on high alert, prepared to supply him with one. Suddenly he signals to her to put it to the side as he’s found another ball at his feet, but she reads it wrong and lobs the ball towards him. As he turns away, she realises her mistake and winces – although fortunately she didn’t throw it hard enough to cause any damage. The Euro 2020 qualifier, Mick McCarthy’s first match back in charge of Ireland, was settled by Jeff Hendrick’s goal early in the second half.